Eric here providing an update on the crew of Still Waters II. Every Thursday, the crew gets a Cruiser’s Weekly Update from WaterWay Guide. The Update provides new navigational alerts, cruising news, and Marina & Harbor Events. 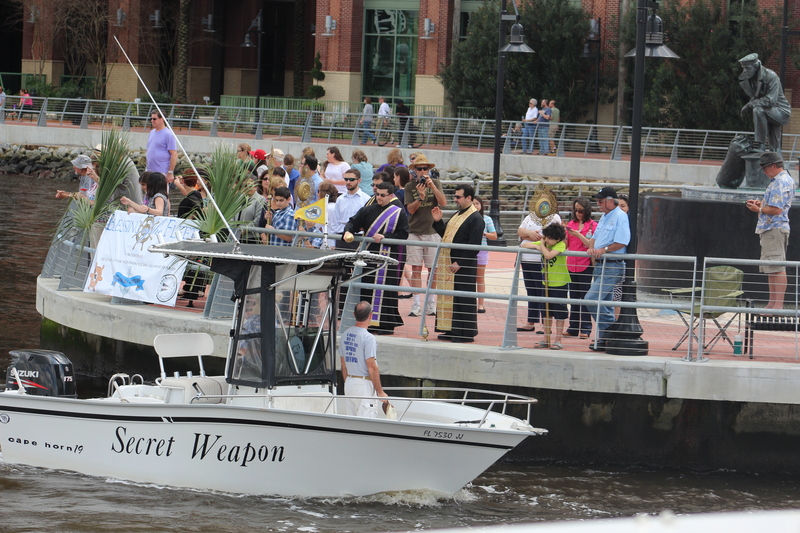 The skipper noticed that the Captains Club and the Jacksonville Sail and Power Squadron were hosting the annual Blessing of the Fleet on Palm Sunday. Blessing of the Fleet is a tradition that was started many centuries ago in Mediterranean fishing communities. The vessel, captains, and crews were blessed to ensure a safe and prosperous season. The tradition is now held in coastal fishing communities throughout much of the world, including in a number of coastal cities in the United States. 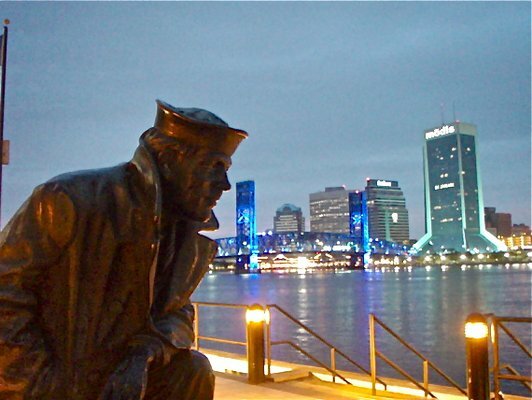 The crew decided to throw off the dock lines and make the hour cruise to downtown Jacksonville. 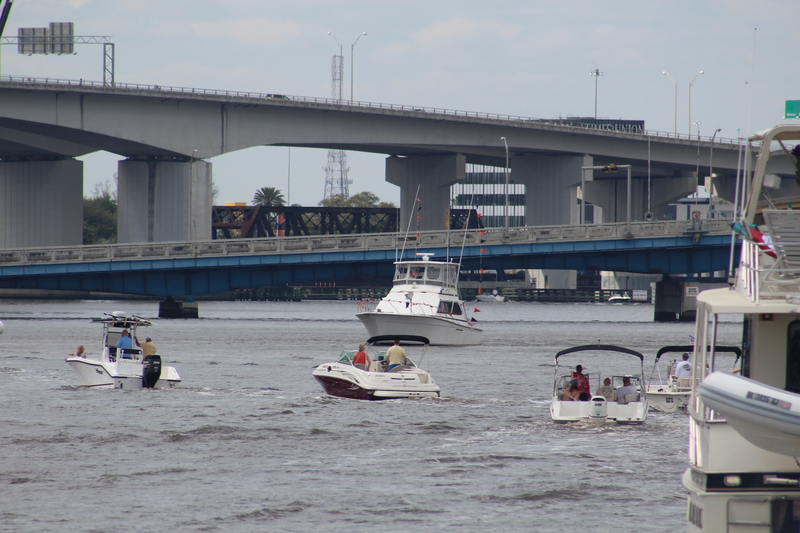 The crew arrived at the staging area east of the statue at 1330 and joined about 50 other boats. The Master of Ceremonies came on Channel 72 at 1345 to give instructions and inform the boaters that they would start as soon as the Padre arrived. Seems he was running late, something about his service running long due to Palm Sunday. 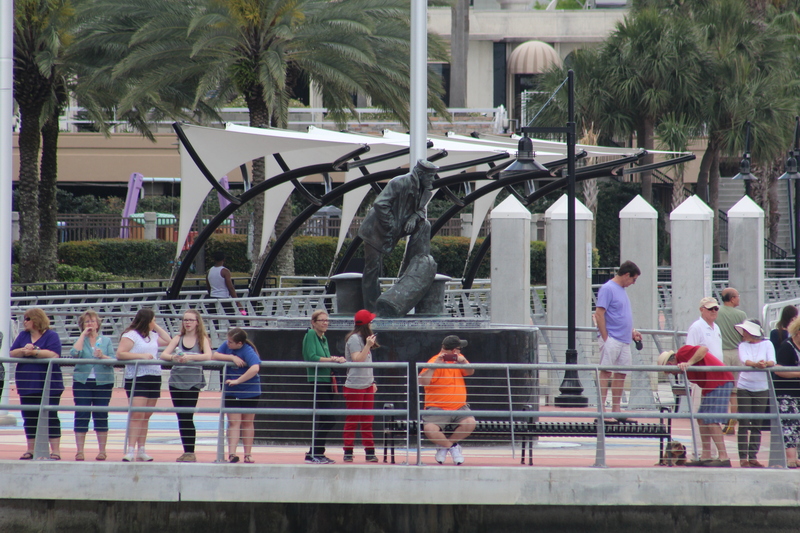 Amazing enough, the Padre arrived a few minutes later and the procession of boats made way to the Lone Sailor Statue for their individual blessing. After all the boats passed the Padre, the official boats formed a wheel in the middle of the river and performed a wreath laying ceremony. Click the Padre pic to watch a 40 sec video of Still Waters II Blessing. Just don’t try to submerge that thing ok!